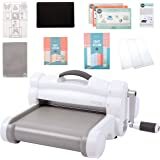 Amazon's Choice for "big shot sizzix machine"
This die-cutting and embossing machine is the perfect tool for a range of creative pursuits for everyone from the beginner to expert! Die-cuts and embosses many different materials up to 6" wide. 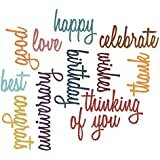 Die-cuts and embosses many different materials up to 6" (15.24 cm) wide. Compatible with the entire Sizzix product library including Bigz, Thinlits and Framelits dies and Textured Impressions, Texture Fades and Impresslits Embossing Folders (with the exception of Bigz Plus and Bigz Pro dies). The Big Shot Machine measures approximately 40 x 29 x 24 cm (14 1/4" x 12 3/8" x 6 5/8") and weighs 4.52 Kg (7.50 lb). 1 Big Shot Machine, 1 Extended Multipurpose Platform and 1 Pair of Cutting Pads. 1 year limited warranty. 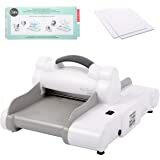 Register your machine for 2 additional years on the Sizzix website. Ships from and sold by Clean Closet Cash. Presenting a brand new look for the Big Shot! With a sleek white and gray color scheme and the Sizzix logo embossed on the handle, this version of the Big Shot Machine offers plenty of stylish appeal with the same versatility of working with the entire Sizzix product library (with the exception of Big Plus and Big Pro dies) - including our smallest to our big 6" wide plastic-backed dies and embossing tools. If that wasn't big enough, this portable roller machine cuts and embosses many different materials. Create your own one-of-a-kind cards, invitations, scrapbook pages, home decor, fashion, altered art, quilting and much more! (To ensure compatibility, always check machine and accessory requirements. Machine accessories may be sold separately.) 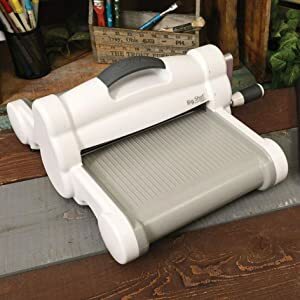 Included with the Big Shot are a pair of Standard Cutting Pads and the adjustable Extended Multipurpose Platform, which makes all Sizzix components thinner than a Big Die compatible with the Big Shot Machine and even works with other brands' dies and embossing tools! 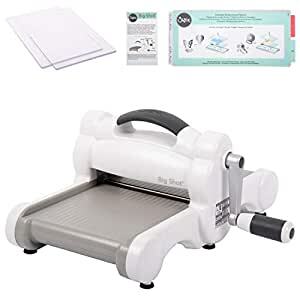 The diagrams on the Extended Multipurpose Platform offer easy guidelines about how to make the perfect Sizzix sandwich. If you like the look instead, check out our classic Powder Blue & Teal model Big Shot machine. 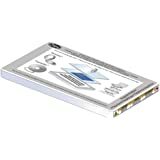 Measures approximately 14 1/4" x 12 3/8" x 6 5/8" and features a 3-year limited warranty. Construction: Solid core steel rollers, anybody cast roller housing, solid steel gears, ABS plastic exterior. With the Sizzix Big Shot, the only limit is your own imagination - now that's a big deal, even for a Big Shot. When it comes to your creativity, the Big Shot is a big deal! Choose from powder blue & teal or gray & white. The easy-to-operate Sizzix Big Shot makes perfectly cut shapes and embossed textures. In just a few turns of the handle, you can create interesting shapes for multiple uses. 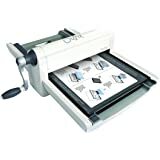 An extended multipurpose platform is included for more compatibility with Sizzix thin dies and embossing folders. Endless creativity for any occasion. With the Sizzix Big Shot, you can design with thousands of different dies and embossing folders (sold separately). No matter the season or reason, chances are there’s a shape that perfectly captures the moment. 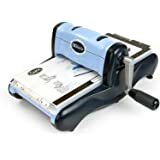 And because it’s portable, the Sizzix Big Shot can be shared with friends when making cards, scrapbook pages, gift tags, t-shirts, jewelry, quilts and more. Cut the right way, right now. A big part of the Sizzix Big Shot’s appeal are the many materials it can cut. 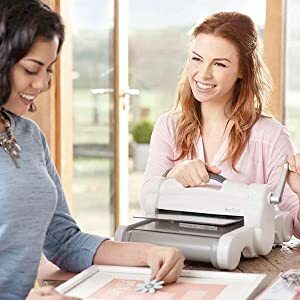 The Sizzix Big Shot can cut everything that scissors can, except perfectly every time! The range of materials is exciting, including paper, card stock, felt, foam, leather, fabric, flexible magnet and craft metal. Cuts multiple layers of thin material at once. 3.0 out of 5 starsPotentially useful tool, great for cardmaking, weak handle screw a potential problem. Purchased the Sizzix Bigshot on Amazon website in June 2016. Product info states that item is sold by Amazon.com. Purchased as a birthday present for avid crafter. Machine used about ten times so far. I noticed that the screw for crank handle periodically comes loose. Today the screw broke while being tightened with the tool that Sizzix provides. It turns out that the screw is much too small for the torque needed to keep it tight during normal use. I did not see this design mistake mentioned in other reviews. The Bigshot looks fairly decent overall but might have a short lifespan. If it came with a good quality screw instead of a Chinese one, that might help, or maybe the manufacturer should include five or ten spare screws with the unit. I did contact Sizzix to see about getting replacement screws and the emailed reply said contact their customer service during business hours. I will report on that after I have a chance to call them. 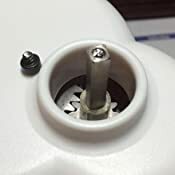 If Sizzix is willing to mail me some screws, or if I can find a better screw locally, the the Bigshot could see lots of use and provide many hours of enjoyment. Update: found a suitable screw, although phillips head, in my computer screw collection. It's good to save stuff! Sizzix Bigshot function is restored but this repair should not be needed. I doubt my experience is unique. 19SEPT2016 Update: contacted customer service and they will mail a hardware bag including screw, rubber plug, and tool. Great! Call took a few minutes with no problems. Also this item DOES have the three year warranty when purchased through Amazon. Hopefully we won't need to take advantage of that. So far, so good! 11JUN2017 Update: machine still is performing well, used at least three times weekly for card making. I periodically tighten the substitute, higher quality screw that I installed, am thinking about add a drop of blue thread locking compound. Blue is the medium strength stuff that doesn't permanently bond screw in place. Don't use red thread locker because you need to heat it if you want to remove the screw! So far the flimsy screw seems to have been the macine's only noticeable weakness. I am also going to take a closer look at the gears, visible when you remove the crank handle, and consider lubricating them, perhaps with a small dab of high pressure grease such as a moly grease. Craft on! 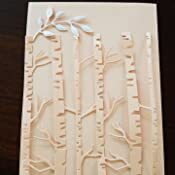 At the time I purchased this, I didn't realize I was "upgrading", but his die cutting machine is far superior (and less expensive) than my previous die cutting machine. I thought the non-folding bed would bug me and get in the way, but the overall footprint of this machine is quite compact. I was initially disappointed at the size of the cutting bed - it just "looked" small. But I haven't found anything that this machine won't handle. I guess I was just used to constantly moving the old one out of the way. It handles everything for a standard greeting card. The best part, it cuts beautifully (with anyone's dies) and you don't have to struggle with keeping it in place with a (mostly) useless suction cup. Grab it by the handle and it takes very little pressure to keep it in place when cutting paper. Thicker material took a little more downward pressure on the handle. The first "failure" came when cutting 6 pieces of brown kraft paper at the same time. It took a little work to move it through the rollers and the bottom layer didn't cut completely. All in all, excellent machine. Makes me want to try other Sizzix products. 1.0 out of 5 starsGreat fabric cutter! I purchased my sizzix to cut fabric for quilting an I am delighted with my choice of this product! I am amazed at how much fabric I am able to cut in a short period of time. I am not an accurate cutter, which is once reason I looked into a die cut machine. 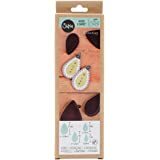 The Sizzix brand is economical and is able to use dies from other companies. Other die systems are not as versital. 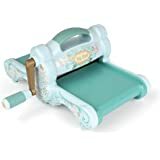 Yes, the dies are expensive, but if you watch Amazon, EBay, and Missouri Quilting Company you will find the best prices and even a sale now and again. Love it! Crystal clear images every time and not hard for me to turn (I’m 25 and athletic anyway, but still worth noting it’s easy to use) Especially the price on amazon vs. Sissix’s website. 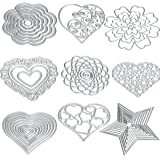 Pro tip: if you live in an area with Darice/Pat Catan’s or a similar discount craft store or frequent the Wish app, they sell the embossing folders and die cutters for CHEAP. 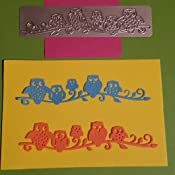 I’m talking $1-$2 each for embossing folders and $3-$5 per die cutting set. It has been such a money saver! 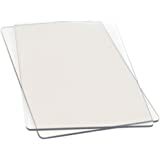 This product has multiple uses; it is able to cut thin substrates as well as thick. So far, all I have cut is fabric and it does a great job with that. I have cut about 6 layers thick of cotton fabric and get nice clean cut every time. I am looking forward to using it on paper and vinyl as well. Only assembly required was putting a screw into the handle and machine is ready to go. I am a quilter and I just finished a quilt using this machine and dies. It was so fast - the accuracy of the cuts with 6 to 8 layers of fabric and sewing the units with no dog ears was just so much more enjoyable. 1.0 out of 5 starsBROKE during assembly!! I unwrapped everything. Deciphered the diagramed instructions and began the assembly process. 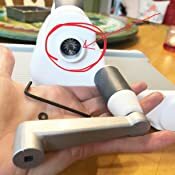 I was attaching the handle with the washer-screw using the enclosed allen wrench and the screw BROKE. Seriously? SO discouraging and frustrating to pay as much money as I did and receive shoddy parts--see the attached photo. I will be requesting a full refund. 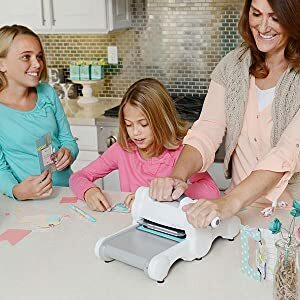 I expected MUCH MORE from Sizzix! 5.0 out of 5 starsA new look for plain tissue napkins! 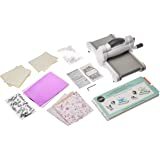 I love this machine-it's very easy to use with so many different,fun folders! My granddaughters (8 & 7) were taking plain white tissue napkins and making them into works of art! I'm not sure who had more fun-them or me:) Of course, decorating cardstock was a blast for them too. I highly recommend this clever machine for almost any age.